The ‘Impossible Forest’ is a new community/public garden project situated in the concrete courtyard of the Uferstudios (center for contemporary dance) in Wedding. This project is initiated by Jared Gradinger in the frame of Tanznacht 2016, supported by Tanzfabrik and the Uferstudios. The ‘Impossible Forest’ is a community/artistic/social/garden project intended to bring much needed green life and blossoming energy to the Uferstudios’ cement grounds and the neighbourhood of Wedding where it will be situated. We will create a new green living space for the artists/students working in the complex as well as the neighbors who often pass through the concrete parking lot. This garden space wants to bring people together; for the creation process, for overall enjoyment and the chance tosimply slow down and watch a garden grow. We have invited artists working in the school and the studios, as well as neighbours, newcomers (refugees), and the greater community of Berlin, to help with the creation and implementation of the garden. This project is a team effort. 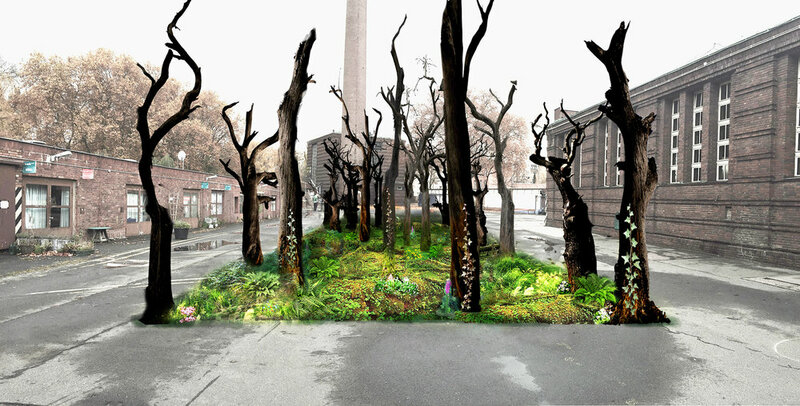 The ‘Impossible Forest’ is 40 X 6 meters and is made up of 13 (already dead) trees that will create the structure for the garden. Normally forest floors host a limited variety of flowering plant life due to the energy the trees need for them to grow. However, in the Impossible Forest, the floor will be covered with wildflowers, local plant life, and garden flowers mixed with the luscious forest greens of mosses and ferns. Each tree will be the host for a unique vine (trumpet flower, zucchini, ivy etc.) that will grow up it, creating shade and its own unique ecosystem. The garden will also be covered with alternative grasses that will be able to be walked and laid upon. The garden is a meditation on blossoming and decay. The space will be used for meetings, picnicking, performance, mediation, learning… . This is a permanent garden and will continue to grow and decay in surprising ways. Jared Gradinger is performer, creator and curator based in Berlin since 2002. He is a founding member of the internationally acclaimed company Constanza Macras/Dorky Park; with whom he has created 8 major works with from 2002-2008. Since 2008, he has taken on different forms of collaborator with Jeremy Wade; performer, dramaturg, writer. From 2006 until 2011 he had an on going relationship with Pictoplasma (Contemporary Character Design) for whom he has staged and choreographed 'Get into Character' in the Haus Der Berliner Festspiele in 2006, created the duet 'What they are instead of' 2009 with Angela Schubot for the Pictopia Festival in the Haus Der Kulturen Der Welt and choreographed 'The Missing Link Show' in the Völksbuhne 2011, amongst other actions. From 2008-2010 he curated the contemporary arts festival How Do You Are/Les Grandes Traversees in Bordeaux. Since his first collaboration in 2009 with Angela Schubot, he has created major 6 works exploring the topic of the 'debordering of the body'. Their work together has been seen throughout the world in very diverse situations. He continues to work with Angela Schubot in the form of pieces, workshops, collaborations and touring internationally including a retrospective of their complete cycle of work in the Hebbel am Ufer. In 2013, he formed the Social Muscle Club with Emerson/Rothmund/Savoldelli. SMC is a social art project that produces different formats for the public to exercise their social muscles. They host regular clubs in the Sophiensaele and are currently working on their new project ‘Neuländish’. He can also be seen in the latest work from Meg Stuart/Damaged Goods ‘Until Our Hearts Stop’. Jared has worked with artists such as William Forsythe, Rachel de Joode, Liz Rosenfeld, Julian Rosenfeld, Leyland Kirby, Aleesa Cohene, Dasniya Sommer, Mark Jenkins, Masagon, Paul Notzold, John Zorn, Laurie Young, Hanayo, Nir De Volff, Ami Garmon, Benjamin Nemerofsky Ramsay, Discoteka Flaming Star, Finger Six and others. In Berlin, he works with the Hebbel am Ufer, Sophiensaele and the Ufer Studios. His latest research involves developing a co-creative relationship with Nature in the form of Gardens and Artistic Practices.